Monday morning in Dublin during a recession is an ideal time to go Christmas shopping, I think. No crowds, plenty of space, a bargain or two. I park in Drury Street, a friendly Corkman relieving me of my car keys and hiding the hire car in the bowels of his underground car park. St. Stephen’s Green shopping centre is not as fancy as it used to be. I wander through a few shops and spend fifteen minutes being assisted with the purchase of a new hairdryer in Boots by a lovely Dublin chap with very little hair. Maybe it’s the Monday quietness, but I cut short my mall window shopping and head on out to find something a little more cheerful. Grafton Street is only coming alive at eleven in the morning. HMV dominates the top of the street, hawking Michael Buble’s new Christmas album from every window. The ladies on the corner of Chatham Street still have the best fresh flowers, with buckets of rose hips to add seasonal cheer to any bouquet. The silver garlands of street lights above me seem to be lit, but the morning sunshine is too much and their effect is dulled for now. I stroll through a handful of old favourites – Vero Moda, Monsoon, Pamela Scott – without being tempted. Pity: I am in the mood for spending money today. I pass somebody dressed as a large green leprechaun, trying to tempt people down to the boutique shops on Hibernian Way. At least he (or she) is warm in that ludicrous outfit. The doorman at Brown Thomas raises his top hat to me as I enter the warmth of its hallowed halls. I am enveloped by the luxurious perfumes of Jo Malone and the sumptuous red and gold of the Cartier concession, both doing brisk enough business for a Monday morning. No sign of a recession here then. I pop into the Post Office on Suffolk Street to post the first of the Christmas cards, passing the rickshaw drivers shooting the breeze outside O’Neill’s pub. Talk about optimistic. The restaurant at Avoca Handweavers beckons, with promises of hearty vegetable soup and impossibly-dense brown bread. I wander through the shop, tempted by locally-made toiletries, vintage crockery, and stocking fillers to the top floor. It is busy enough, but not packed. Most of the staff seem to be Irish. Last time I visited this place all the wait staff were Eastern European. My handsome Aaron Eckhart lookalike waiter approves of my order of a glass of prosecco with fresh raspberries. I am tempted away from hearty soup with the promise of a horseradish, walnut, roasted pear and Cashel Blue cheese salad. I sit at the back of the restaurant amongst the perfectly mismatched furniture, with a good view of my fellow lunchers. They are a predictable mix of well-heeled people of a certain age (which I define as ten years older than me) and a handful of local workers on their lunch break. Two girls beside me discuss the hundreds of redundancies about to be announced in one of the biggest Irish high-street banks. As I stand to pile on the layers against the cold outside, I hear my name being called. I look around to see the sister of an old friend waving at me from the corner. I have not seen her in over seven years, and we embrace fiercely. We talk over each other, trying to catch up on years of news, sharing iPhone photos of new babies and old partners, before promising a longer catchup on my next visit. What a lovely surprise. I burn another hole in my credit card at the Kilkenny shop. Well, who could resist locally-made smelly candles called Bog Standard? 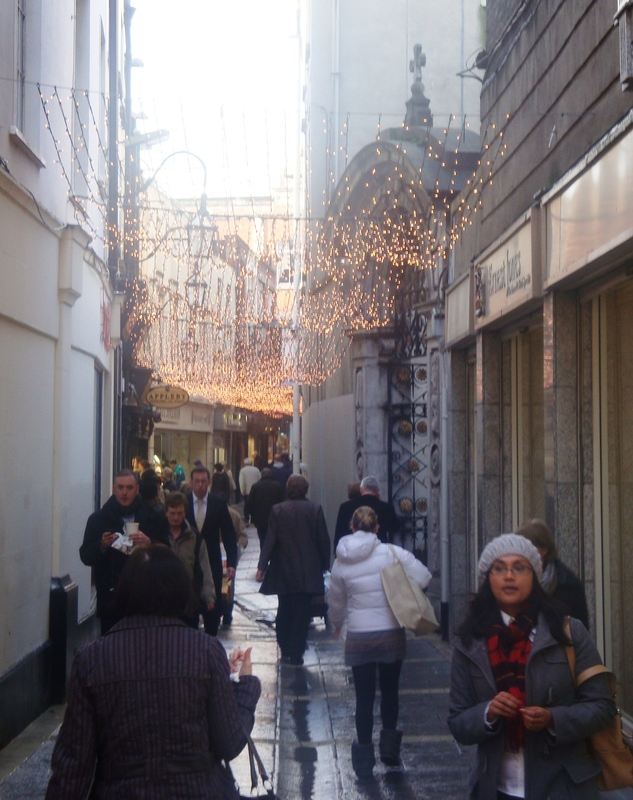 The afternoon is fading as I retrace my steps back up Grafton Street. The street lights are beginning to twinkle in earnest now, and the crowds have thickened a little too. That’s more like it. I head back to the first shop I visited in the morning, and purchase the first of many overcoats I have tried today, along with three new Little Black Dresses and countless other articles I simply could not do without. The walk back to the car is looking more and more torturous by the minute. It is almost five, and almost dark. I savour the slow walk back down Grafton Street, now a beautiful ribbon of silver at dusk, the shops looking festive and the crowds good-natured. This is one of the reasons I made the long trip back to Ireland at such a cold time of year. It’s not Christmas for me without this scene. My car emerges from the deep and I wind my way home through the Liberties, past St. Patrick’s Cathedral and Christchurch Cathedral, past St. Audoen’s church, the oldest parish church in Dublin, Christmas FM on the radio. I went to school near here, down the back of Francis Street at the Holy Faith Convent. Thomas Street is dull and depressing. The worst of the GFC is apparent here: no Christmas lights, lots of boarded-up shops, the handful of street stalls selling only cheap tat. On down James’s Street I drive, past St. James’s Gate, the home of Guinness, and turning onto narrow Kilmainham Lane. You would never imagine such a winding country road could be found just a couple of miles outside the very centre of a capital city. Ten minutes or so later I am home, decanting armfuls of bags from the car to the living room and presenting everything to Mum for her approval. An hour later I am back in the car, retracing my steps back into town to meet Joe and Elva for dinner in Chez Max on Baggot Street. We are yards from where we all went to university, and although I have not seen them for a year and a half, the time melts away as we relax into our usual banter. The wine flows and suddenly it is time to go. We will not leave it so long again – next year is the twenty-fifth anniversary or our graduation. The streets are empty and dark as I wend my way home. I curl up on the sofa and catch up with Mum before bed, happy with the amount I have crammed into one day. I fall sleep in my childhood bedroom, surrounded by familiar pictures and books. It all begins again tomorrow. Mainland Australians, generally, don’t do cold weather very well. I exclude Tasmania, of course: those people know how to rug up and still look stylish. I once spoke to a girl from Perth who had struggled on for two years after she arrived in Melbourne, before realising she actually needed a different winter wardrobe. She had spent two winters wearing thongs (flip flops to you northern hemisphere types) and shivering in a light cardigan before noticing that she really ought to be wearing knee-high boots and a decent woollen overcoat from June to September. Melburnians are a mixed bunch. You will see women going to work wearing sensible footwear and a long coat, but so often you will also see women shivering on the street, walking to work with bare legs and a scarf around their necks, like that is going to protect them from the bitter winter temperatures. Irish women are entirely more sensible without losing their individual sense of style. Irish autumn, winter and spring can be miserably cold if you are not dressed for the weather, so people do. Your average stylish Irishwoman has a selection of winter coats (my sister Annette remarked yesterday that she needs another overcoat like a hole in the head. She has about six). The average Irishwoman also has a range of stylish winter footwear often including a range of knee-high boots of various colours and heel shapes. At Newbridge Silverware on Saturday afternoon, the women of Kildare were at leisure. I stopped short of photographing some of the stylish women in the jewellery showrooms and elegant cafe. Warm, knee-length fitted woollen dresses in this season’s block colours were teamed with colour-coordinated jewellery, a fabulous pair of knee-high black patent leather boots and matching handbag. A larger lady was resplendent in a floor-length fitted woollen skirt in a shade of plum, with a sharp bob haircut, sensational accessories and a long heather-coloured knitted cardigan. I would have felt under-dressed but for my decent black-and-cream print three-quarter length mac that made my casual outfit look sharp and in-season. Hats are in – they are every year, it’s too cold to venture out without one. However no Irishwoman would shove a knitted tea-cosy hat on their head unless they were about to go hiking, and even then it would probably be a decent Gore-Tex job. Hats generally match the overcoat, or possibly the shoes and bag. And there will always be matching gloves. Cloche hats and similar shapes are quite popular, because they are not easily dislodged by the wind. Similarly, hats that can be scrunched up and shoved into your handbag are much more preferable to one you have to hold in your hand when not wearing it. It makes high street shopping and going out much easier, with all that dipping into and out of the shops or dashing between the pub and the restaurant. But beanies on a woman of any age beyond seven or so? I don’t think so. Pashminas and scarves also loom large, for keeping the breeze away from chilly necks or for drawing around your shoulders in a draughty cafe. They are never Granny-like, and each woman has her own way of wearing hers. Doubled over and linked around the neck; draped casually over one shoulder to accessorise the overcoat; folded neatly and carried in the handbag just in case. Vibrant colours are most popular, to give the most sober of outfits a colourful lift on the darkest of winter days. Loud prints, however, are avoided in favour of block colour. And Irish women are never afraid of a statement necklace or two: the bolder, the better. Even casual is done well. Jeans are popular in Ireland as in most places. They are teamed with a warm hip-length coat or maybe a slim-fitting padded jacket. Knitwear is always in. Last night Annette teamed a pair of skinny jeans with ballet flats and a fitted knee-length mohair dress, accessorised with a thin belt and a statement pashmina. Today I shall dress carefully before heading into town to spend the day shopping on Grafton Street, Dublin’s most fashionable shopping precinct. Layers of pure wool that I can peel off if I get too warm, a large handbag and additional reusable bags to carry my purchases – plastic bags were outlawed in Ireland years ago. Although I love the feeling of collecting all those posh paper shopping bags they give you here: I always feel like I am in a scene from a movie, strolling down the street with armfuls of them, my new things beautifully wrapped in tissue paper inside. A hat, of course, from Tasmania’s Salamanca Market and a pair of killer heels. Some carefully-chosen statement jewellery and, in my case, a matching bindi. That is all I need to acquit myself well amongst the Dublin Ladies Who Lunch. Hong Kong to London: the second leg of my epic thirty-hour odyssey to the other side of the world. It is a busy flight, but not full. The Northern Irish girl beside me is flying home because her aunt – forty-five years old like me – had a brain haemorrhage a couple of days ago. The girl herself is travelling with a stress fracture in her hip and is already in huge discomfort, a cabin crew member having sent her flying as she boarded. I count my blessings. When the seat belt sign goes off, the girl moves to stretch out along the empty back row of the plane. I settle into my two-seat domain. I am near the back of the plane and there’s extra room between my seat and the window too. On a thirteen-hour flight, all the additional space is luxury. As soon as the plane levels out I setup my factory line: a stack of blank Christmas cards and envelopes, mobile phone for the addresses, a decent pen (ballpoint, not fountain to avoid altitude leaks), Christmas music on the Walkman streaming through my noise-cancelling headphones. My fluffy socks keep my feet warm and the window blinds are pulled to keep off the glare. Valentino the steward approaches. He knows me by name, probably because I am a Gold frequent flyer. He offers me a fast-track card to get me through the UK border formalities more quickly. A strong gin and tonic materialises beside my Christmas card factory line, perfecting the scene. Later, I give the fast-track card to the girl from Northern Ireland. She only has an hour to transit from Terminal 3 to Terminal 1: she needs it more than I.
I get scribbling, the addresses on the envelopes occasionally falling victim to turbulence. I wonder will Fiona notice the writing on her envelope and wonder why I had a six-year-old help me. The Alzheimer’s Association cards are green and sparkly. By the time I am finished, my comfortable matt-black travelling outfit is sprinkled with glitter. How festive. Chris Rea sings “Driving Home for Christmas”. It always reminds me of going home for Christmas back in the eighties, driving from my home in Leicestershire to Birmingham Airport to catch my flight to Dublin. It always involved sitting in a traffic jam on the M42: top to toe on tailbacks. I had red lights all around. This morning -evening? I am not sure what time zone I am in – I have tired faces all around. My fellow travellers aren’t driving home for Christmas, and neither am I. But I am looking forward to putting up the tree in the house where I grew up; late afternoon on Grafton Street with the Christmas street lights starting to twinkle; the huge tree outside Trinity College and another outside the GPO; drinks and dinner with old friends. After thirteen hours we circle London a couple of times, the city laid out beneath us like a glistening prize. The Thames snakes along, adorned left and right by familiar sights: the London Eye, the Houses of Parliament. Newer landmarks are emerging too like the huge Olympic stadium out near Hackney, and the Shard on the south side of Tower Bridge which looks like it might usurp the Gherkin’s place in my heart as my favourite London building. Heathrow is painless enough. I sail through the formalities even without my fast-track card. The London accents and multi-hued faces make me feel like I am home again. I miss London. In Terminal 1 WH Smiths and Harrods look just Christmassy enough, Smiths with bright stars on hanging banners and 50% off signs everywhere, Harrods with entirely more classy decorations and the Portmeirion China Christmas collection out front in pride of place. I pick up a few items in the Tax Free store, realising how sleep-deprived I feel when I open my mouth to say something coherent to the Clinique lady, and fail. I sit in the main concourse listening to flights being called in English, French and German before capitulating and fleeing to a fake alehouse for a pot of tea and a scone. On the one-hour BMI flight I doze, waking just in time to see the coastline of Leinster lit up in the twilight. Even in the darkness I know this stretch of coastline well enough to recognise major landmarks, and I can tell we make our approach over Malahide where my sister lives. Finally, after almost thirty hours of travelling without moving, I touch down in the city of my birth. Annette is waiting for me at Arrivals, as always, and she leads me to the bar where I sip a hot cup of tea with sugar to help combat the jet lag. It is good to be home. I pick up the hire car and head south on the M50. Almost there. I stop at the local chip shop (chipper in Dublinese). I stand waiting for my food – smoked cod and chips, of course, with a side of curry sauce. I am surrounded by family history. My father, grandmother, aunt, uncle and many more relatives and neighbours are buried in the graveyard to one side of where I stand. My parents used to drive over for a Saturday night drink in the pub on the other side of me. My mother grew up half a mile down the road, in a white-washed cottage with no running water. My cousin now lives in the more modern house that was built there when the cottages were torn down in the fifties. I took piano lessons just down the street, next to the school where my mother worked for almost forty years. I stop the hire car outside the house where I grew up. My mother stands in the doorway, ready to greet me. We have not seen each other for almost eighteen months. The door is opened wide in welcome, and she pulls me to her in a welcoming hug as soon as I pull the heavy suitcase into the hallway. Over the next ten days, Mum and I will squeeze in a festive visit to Newbridge Silverware and Avoca Handweavers to drink tea, eat home-made cake and (in my case) buy more jewellery. Annette and I will kick the Christmas spirit off at Taste of Christmas on Saturday night. We will cut and sample Mum’s Christmas cake and pudding on Sunday after Mass, and my cousin and I will re-enact the ancient Donoghue family tradition of critiquing the baked goods in the annual comparative study: “Oh, your pudding is nicer than mine this year Maggie.” “No, Molly, I think mine’s a bit dry…”And Ashling and Connor will help me give the credit card a workout, Christmas shopping in the city I know so well. Christmas FM -All Christmas Radio – will start broadcasting on Tuesday and then the festive season will have really begun. The rain has stopped its unremitting misery for a few hours and Dublin is at its wintery best. Despite the wet streets and darkly-clad lunchtime crowd, there is a distinct Christmassy feel. Even in early afternoon the light is dull enough to show off the chandelier-like garlands of silver lights on Grafton Street laneways, twinkling already. Bewleys pile the mince pies high and the flower ladies on Chatham Street have poinsettias for sale alongside their lilies and roses. In every shop I enter, people are happy and friendly and talk to me as if I were a regular. But this is not Christmas cheer: this is just Dublin. The southside shopping precincts show little sign of the recession. Marco Pierre White’s restaurant seems busy for a lunchtime and the jewellery stores along Johnson Court appear to be doing well. No 50% off stickers anywhere; no shops closed up. It’s business as usual. Perhaps it is different in the more downmarket Henry Street. I visit the Government Publications shop and buy a couple of copies of our Constitution. The one I have must be thirty years old and long out of date. I think we still lay claim to the six counties in that version. I flick through the little blue book, with the English words on the left-hand pages mirrored as Gaeilge opposite. It gives me a degree of comfort, of things being as they should be, to hold a copy of the basis of the nation in my hands. I narrowly avoid purchasing something in Louis Mulcahy’s artisan pottery shop, in the Powerscourt Centre, in Avoca Handweavers, but I capitulate in (of course) Dubray Books. It’s hard to resist a good bookshop. The old stalwart restaurants of Wicklow Street are still in business. Marco Pierre might be in town but the Trocadero, the Cedar Tree and QV2 remain too. 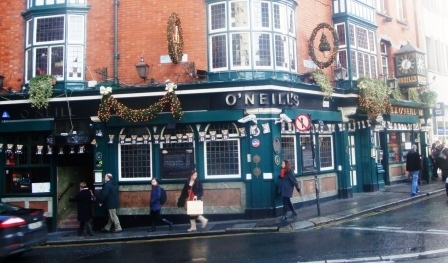 O’Neill’s pub is exactly the same as always but the Old Stand has had a facelift. 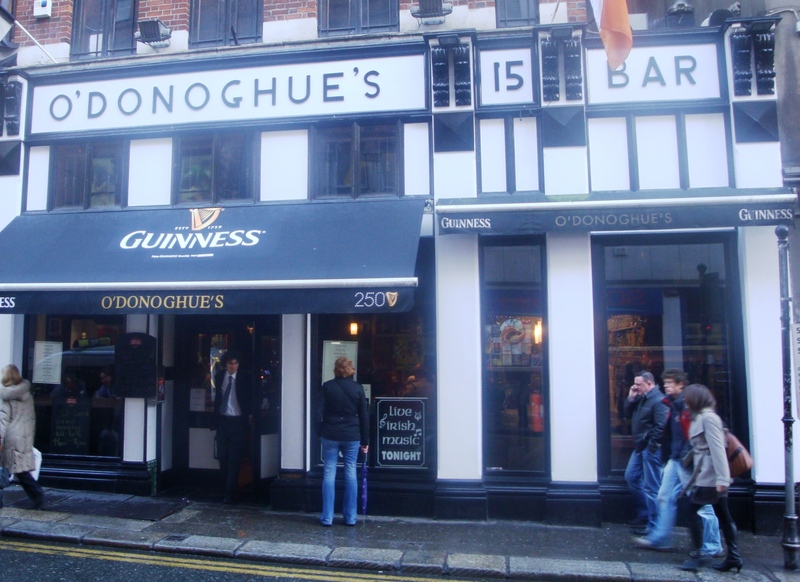 A fake O’Donoghue’s pub has appeared at the bottom of Grafton Street to fool the tourists. The real Dubs will know that the original one still packs them in every night on Merrion Row, round the corner from where we went to University. I sip a coffee and contemplate my home town. I have not lived here for over twenty years and many things have changed, but not enough to alienate me. Dublin is what made me. It is still home. But the coffee’s still shite.